The Signing Ceremony of Shenzhen ZhongJiang Smart Technology limited has been successfully completed on 31st March 2017. 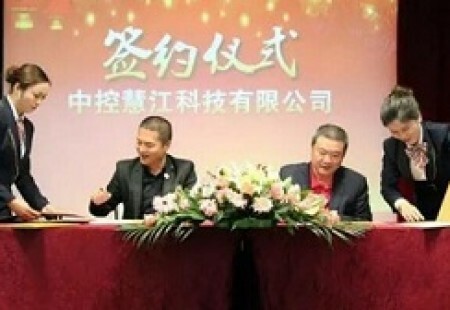 John Che, the CEO of ZKTeco, Chen Feng, the Executive Chairperson of Chinese Entrepreneurs Association,Yang Jincai, the Chairperson of Shenzhen Security Industry Association, and Hou Xiang, the Secretary General of Chinese Entrepreneurs Association attended the Signing Ceremony. ZKTeco, founded in 1998, is a globally pioneering enterprise of hybrid biometric verification technology, and owns various global patents and own intelligent property rights, and widely applies biometric verification technology to smart office, smart finance, smart traffic, and smart security etc., its service network is globally distributed. Hui Jiang Investment Group Holdings Limited was founded in 2003, with its headquarter established in Shenzhen. It is a diversified investment and stock-holding group which integrates construction material manufacturing, warrant, auction, fund management, real estate investment, domestic business and trading, international investment, property management, car renting, security service, catering, scientific farming (dendrobium and betel nut etc.). Its investments are widely distributed in 18 cities in 9 Provinces in China. Chinese Entrepreneurs Association is an renowned resource integration service platform which integrates financial, conference, industry and government services. It owns Chinese Entrepreneurs Association International Club, Chinese Entrepreneurs Association Fund Management Limited, Peace Stone Fund Management Limited etc. wholly owned subsidiaries, and has bought and controlled shares of more than 20 enterprises, and has been leading the industry. Shenzhen ZhongJiang Smart Technology limited, co-founded by Chinese Entrepreneurs Association Group, Huijiang Group and ZKTeco, is based on resources, initiated by strength and prospered by technology. Shenzhen ZhongJiang Smart Technology limited will uphold the advantages of the 3 enterprise and be the best in the industry.